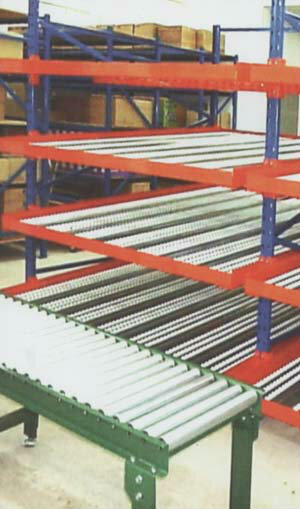 Flow rack/pallet Live Storage System are compact structures which has built-in rollers om the base of the Stored items to the picker. This type of system is suitable for use across many business sectors mainly in Stationery, Electronics, Food, Pharmaceutical and Music industries to name a few. Operating on the principle of "First In Firdt Out" (FIFO), the combination possibilities are endless-from small parts to palletized or even combining this with an integrated conveyor belt/drive to maximize picking conditions. The System uses the conveyor rollers of the highest standards ensuring durability and reliability. It comes complete with entry guides, pallet swparators, brake rollers and end-stops. This system is also ideal for usage in cold rooms which offers FIFO Op erations and hign density storage.